New publication by AICA members Jo Applin and Briony Fer to accompany the exhibition at the De La Warr Pavilion. Alison Wilding RA (b.1948) is one of Britain’s foremost sculptors. Tracing the trajectory of her artistic evolution, this original publication provides the first critical survey of Wilding’s rich career. Known for her use of contrasting materials and often pairing forms in precarious juxtapositions and balancing acts, recent works combine string, steel and hair, mirrored glass, silicone rubber, alabaster, sand and painted foam. Resisting categorisation, Wilding’s sculptural language steps beyond the so-called ‘new sculpture’ which emerged within Britain in the 1980s, to embrace the European and American vocabularies for producing large-scale abstract sculpture that appeared from the 1960s onwards. 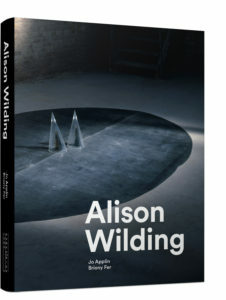 Drawing on extensive interviews with the artist and referencing numerous secondary sources, this impeccably researched and beautifully produced publication will situate Wilding’s work within its rightful place in the history of modern abstract sculpture.